This story starts way back on 15th September 2011. One of the things I love about brewing is knowing that other people are enjoying the beer I make – I love to share my beer, to get others to try it and to see what they think of it – hopefully, they like what they taste. 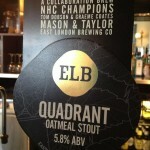 Without doubt the best beer of our festival has been @eastlondonbrew Quadrant Stout. It’s one of the best stouts I’ve ever tasted. Back in September 2011, I attended a “How to Judge Beer” course run by The Beer Academy at the White Horse in Parson’s Green. After the course I was chatting to some of the other attendees, pretty much all of whom were in the trade themselves – either bar staff or owners of pubs. One of the people I started chatting to was Ed Mason, and I told him about my recent success in the 2011 National Homebrew Competition a few weeks beforehand. A short while after, I got an email from Ed, asking if I’d like to brew some beer for him to go on sale in a bar called Mason & Taylor in Shoreditch, which he part owned. Answer: “Sure! Find me a brewery I can brew it at!”. After a while (we’re all busy people...! 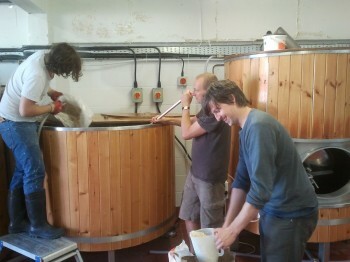 ), Ed’s colleagues Steve Taylor and Sienna Croucher took up the task of finding a suitable brewery, having good connections with local London breweries – and around Easter 2012 we met up with Stu Lascelles and Greg Hobbs from the East London Brewery to discuss the possibility of doing a collaboration beer. I say “we” – I also suggested that we invite along Tom Dobson, the 2011 UKNHC Champion* to participate. 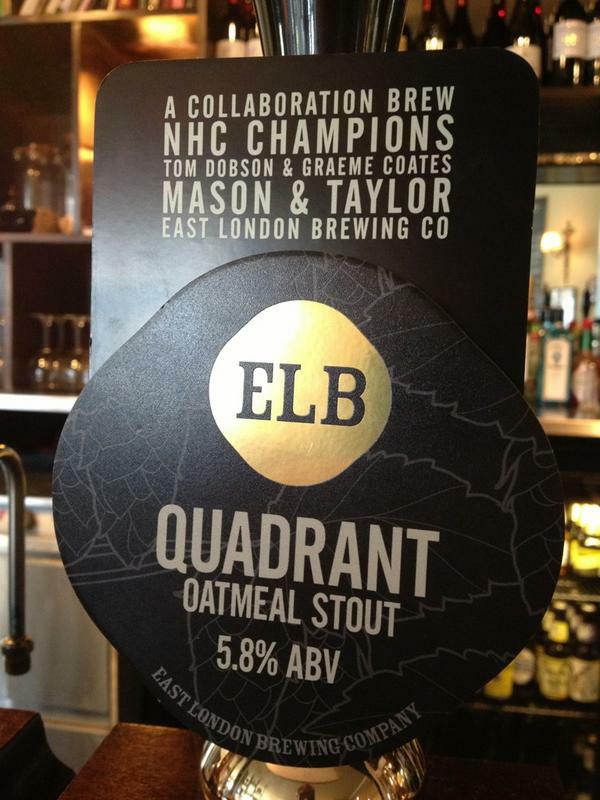 Out of this four way partnership was born “Quadrant” – an Oatmeal Stout that finally went on sale in London on 2nd Oct 2012. (The name suggested by Stu – partly because of the four way collaboration, and partly because Stu has fond memories of the pub of the same name in Brighton!). Tom and I developed the recipe, and I brewed a prototype using ELB’s yeast strain (this is the stickiest yeast I have ever used by the way – I need to reculture and slant this out from the bottles I have...!). The unchanged recipe was brewed up by us four on the 31st Aug – and without giving away too much about the recipe, some nice tricks were used in the process to get the smooth roast flavour we were looking for in the stout without being harsh and astringent. The launch took place at the Duke of Wellington in Dalston (after Mason & Taylor sadly closed before we could launch there) – and feedback has been excellent. The Gunmakers in Clerkenwell had it in their festival and from the looks of it (above! ), got some great response from staff and punters alike. It’s also in other pubs around town like The Red Lion in E11, the Union Tavern, The Alehouse (Reading), The Stag (NW3), The North Pole (N1), The Southampton Arms (NW5), The Jolly Butchers and Sebright Cellar. Big thanks to Stu and Greg from ELB for allowing Tom and me into their brewery, to Steve and Sienna for helping organise it all, Ed for kicking the whole thing off, and the guys at the Duke for trusting us with a previously unsold beer! If you get a chance to try it, I’d recommend it – not just because we helped brew it (and it’s the only commercial beer I have a hand in so far-though if you own a brewery and are mad enough to let a homebrewer loose in it, let me know! ), but because we reckon it’s pretty good. And let us know what you think of it – because I’d love to hear that you enjoyed it. PPS: * I had an even better year this year too, oddly a year to the day after the course at the White Horse – and I’m off to brew with Nøgne Ø for a week at some point in the New Year! I must have missed this write up. Just wow! to have a beer you thought up and brewed (along with the others) is brilliant. When we meet for that beer (?) I’d like to hear more about your methods for taming the roast flavours. Really well done to you and Tom and ELB. Have a great trip to Nøgne Ø and let us know all about it. I’ll be back at UKNHC next year looking for that illusive rosette! Cheers! Very cool to see this beer sold on bars round London and to see people enjoying something we all worked on together! Happy to chat about techniques whenever!